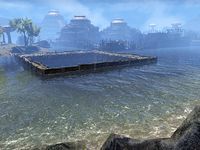 Vivec City is the largest city on Vvardenfell and the home of Vivec. It consists of ziggurats surrounded by water, and is currently under construction. The moonlet Baar Dau hangs suspended in the air above the city. 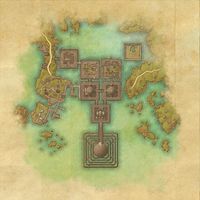 So far, only the St. Delyn, St. Olms, Temple, and Palace cantons are completed and accessible. 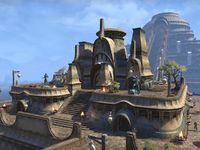 The future Hlaalu, Redoran, Arena, and Telvanni cantons can be seen in varying levels of construction, and there is (unsurprisingly) no evidence of any work being started on the Foreign Quarter canton. Vivec City Objective: Explore Vivec City and meet Lord Vivec of the Tribunal. Room to Spare: Obtain the deed to an inn room. 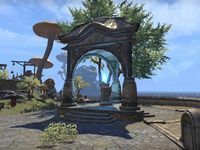 Vivec City Wayshrine is located just inside the northwestern entrance to the city, south of Pilgrim's Approach. 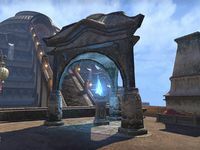 Vivec Temple Wayshrine is located in the southeast corner of the Temple Canton. This page was last modified on 19 November 2018, at 07:04.